Our eternal thanks to Edward and Adelaide Connell of Florida for these and other wonderful pictures of the grave site. There is a never ending interest in Houdini's Grave site. He is buried in a gravesite in New York City which was his home for most of his life. The grave is across the river in Queens, near the Brooklyn border. It is very private and none are allowed unless they are related. Hence, we do not put the address. There has been vandalism, publicity stunts by magicians and others at the grave site. His entire family is buried at the grave site, mother, father, sister and brothers, etc. 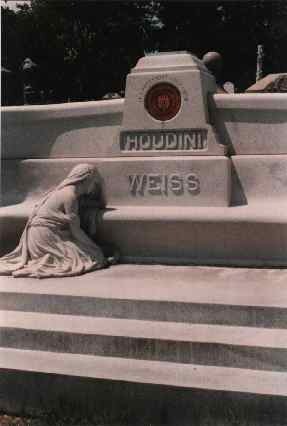 Here at his grave site you see his chosen name Houdini and his real name, Weiss. He left a large sum to the Society of American Magicians, the equivalent of about $40,000.00 in todays currency. The bronze colored round crest in the center top of the grave site monument is the crest of the Society of American Magicians. Make no mistake about it Houdini loved magic and magicians. He left his gigantic collection of books on theater and magic to the Library of Congress for future generations to study, rather than sell it for personal gain. It is worth millions. His wife is not buried there. 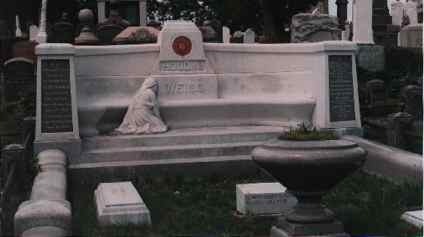 There is a spot for her as you can see her name on Houdini grave stone below, but her family did not want her buried there after she died for religious reasons. She did want to be buried in the same grave with Houdini. We have a copy of his will in our collection. Go to Houdini Contents list. However until we get more members, we do not have the funding to email as much as we would like to. We do answer members questions where possible. Please become a member, get your certificate, pin, etc. Pull Down - HOUDINI PAGES Biography-Houdini AREA'S BEST MAGICIANS PAGE plus magician Harry Houdini riding trains. Grave Site Interesting Facts Historic Local Appearances Houdini Graphics Hardeen, his brother. Mediums & Fakes he exposed Local writer saw Houdini Houdini! Movie Star Our Offical Seances Seances on the Internet Halloween Magic Shows Dunninger's Fake Claims Souvenirs T-Shirts - Collectable Posters (some for sale) Souvenir Order Form Recent Acquisitions Scranton Theater History You can link to us The room where he died. Famous Scranton Challenges Movie - "Man From Beyond" Houdini Moves Great new book, "Houdini"
This web site includes Houdini's biography, Houdini's tricks, Houdini's death and grave, Houdini quotes, the Houdini movies or Houdini movies, our Houdini Inc., Houdini's real last name, and Houdini's magic.